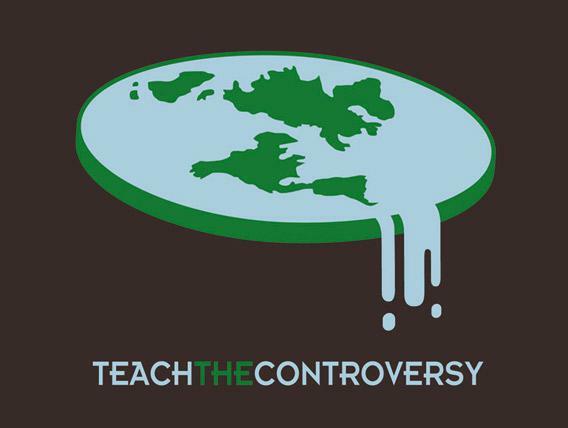 Climate change denial is like believing the Earth is flat. Would You Vote for Someone Who Thinks the Earth Is Flat? Think about this for a moment: Would you vote for someone running for Congress—or to be president of the United States—who thought the Earth was flat? And I don’t mean someone who’s just flirting with the idea, but someone who really, truly believes the Earth is a flat disk floating in space. Someone who refuses to accept any and all scientific evidence to the contrary no matter how obvious, someone who is proud of his belief, who campaigns on it, who actually holds hearings about it, condemning scientists and even threatening their careers because those scientists say the Earth is round. What would such a person do with legislative power over, say, NASA? Can you imagine yourself voting for him? Now imagine casting your ballot for a climate change denier. Someone like Rep. Lamar Smith (R-Texas) —who currently is the chairman of the House Committee on Science, Space, and Technology— or Sen. James Inhofe (R-Oklahoma), Donald Trump, Mike Pence, or practically every single sitting Congress member with an R for their political affiliation (although there is hope some bipartisan work can be done). At this point in our understanding, I see very little difference between denying climate change versus someone who thinks the Earth is flat, or that the Moon landings were faked. All these people deny the overwhelming evidence and substitute their own fevered imaginations and biases for reality. There will always be people like that, of course. Denialism will never die. But that doesn’t mean we have to give them power over us. I agree with Dr. Mann; there will always be people who will deny reality even when they’re standing chained to the railroad tracks with a train 10 meters away and bearing down on them at full speed. Especially for those who receive a whole lot of funding to stick their fingers in their ears and yell “LALALALALALALA” at the top of their lungs. And when it comes to climate change, we’re chained on the tracks with them. We’ve been trying for years to get them to take their fingers out of their ears and open their eyes, and it’s long past time to admit this isn’t working. They refuse no matter what we do. We need to cut ourselves free of them, and replace them with people who understand that we need to step off this track. Vote. For yourself, for everyone you know, for future generations: Vote. If we want to stop the train, the first thing we must do is elect politicians who at the very least understand that it’s real, and that the danger we face is very real as well. Tip o’ the voting booth lever to Michael Mann.